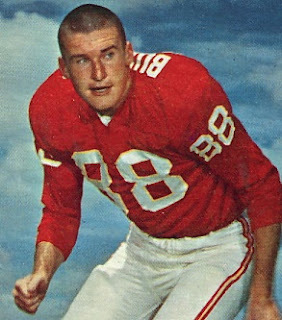 Burford caught a NCAA-leading 61 passes for 757 yards in 1959 and received first-team All-America honors from the American Football Coaches Association and Time magazine. He was chosen by the Cleveland Browns in the ninth round of the 1960 NFL draft but signed with the Texans of the new AFL and had 46 catches for 789 yards (17.2 avg.) and five touchdowns as a rookie. Burford followed up with 51 receptions for 850 yards (16.7 avg.) and another five TDs in ’61, when he was also named to the AFL All-Star Game. What he lacked in speed he made up for in moves, technique, and reliability. Texans went 11-3 to finish first in the AFL Western Division while leading the league in touchdowns (50, tied with Houston Oilers). Won AFL Championship over Houston Oilers (20-17). The team moved to Kansas City in 1963 and Burford, recovered from the knee injury that cost him the last few games of the ’62 season, caught a career-high 68 passes, for 824 yards (12.1 avg.) and nine touchdowns. He went on to play with the Chiefs until 1967, and started for the ’66 AFL Championship squad that appeared in the first Super Bowl. Overall, Burford caught 391 passes for 5505 yards (14.1 avg.) and scored 55 TDs. He received All-AFL honors once and was named to one AFL All-Star Game.